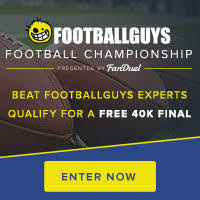 Each week of the 2015 NFL season, we will be highlighting wide receivers or tight ends with good or bad matchups heading into FanDuel contests. Defensive guru Aaron Rudnicki will lend his thoughts to take advantage of under-the-radar players facing favorable defenses or avoid pitfalls from those with tough matchups. Miglio: Reports swirled during the preseason that Rishard Matthews was pushing Kenny Stills for a starting job in Miami. That very well may be the case thanks to his years-long rapport with quarterback Ryan Tannehill. Stills being a newcomer meant a learning curve. Just because Matthews was having a great preseason doesn’t mean Stills won’t play plenty, though, and his deep threat represents a nice GPP option at a good price. Rudnicki: Washington should be a favorable matchup as they struggled in coverage during much of the preseason. Free agent signee Chris Culliver should provide an upgrade at one corner spot, but DeAngelo Hall is coming back from an Achilles injury and unlikely to be in top form yet. Bashaud Breeland will miss the game while serving a suspension, and is likely to be replaced as a nickelback by David Amerson who struggled mightily as a rookie in 2014. The pass rush also figures to be weakened since Ryan Kerrigan missed the entire preseason while recovering from knee surgery in June, andTrent Murphy is a huge downgrade from Brian Orakpo on the other side. Tannehill should have time to throw, and I’d expect Stills to be matched up primarily with Hall on the right side making this a very favorable matchup. You can read more matchup goodness on the site (subscribers only).